I first fell for huge, chunky slabs of dark chocolate shortbread when I made a pilgrimage to Extraordinary Desserts in San Diego. If you enjoy sweets and are ever within a 50-mile drive of the place, you MUST GO. There are two locations. Go earlier if you don’t want to be disappointed, because stuff sells out pretty quickly. Karen Krasne, please, please open up a shop in Norcal. Please. I bought your book and all the supplies you recommended in it, but then I had a baby and I haven’t made anything from it yet. I just drool over it and wish you would open up a shop up here already. Please. One thing the gorgeous cake book does NOT include is a recipe for Karen’s extraordinary chocolate shortbread, though, so I’ve been on a mission to make something as close as possible. Her shortbread is not dry and sandy and crumbly like your typical shortbread (which I also love, but in a different way). It’s huge and mouth-filling and intensely cocoa-y in a way a small shortbread cookie could never do. 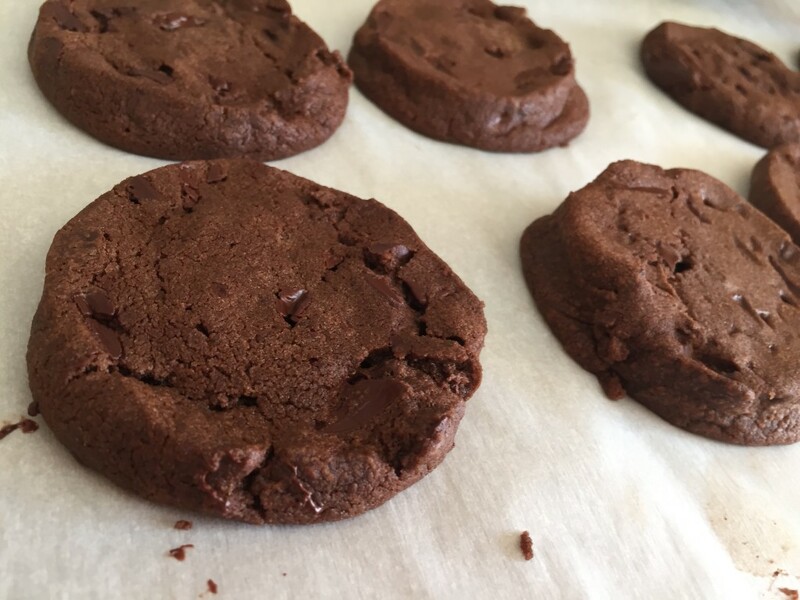 I’ve tried a number of chocolate shortbread recipes in an attempt to recreate hers, and recently re-tried one that, for some reason, I passed up before: Dorie Greenspan’s World Peace Cookies. It got a second look because my friend Diana, over at Chomping Board, made some for us while we were providing her with a meal delivery (talk about hospitable!). I was sold. I went home and got to work on the new recipe that very week. After making Dorie’s cookies according to her recipe- dainty little teatime circles- I decided to double the recipe and make huge rectangular slabs of it in an attempt to imitate the ones at Extraordinary Dessert. So I tweaked the preparation a bit and… GUYS, IT WORKED! 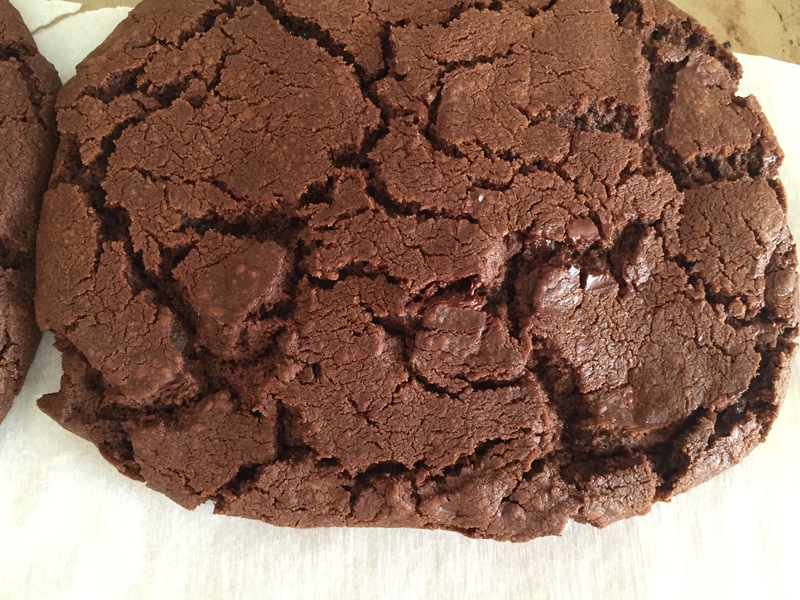 Mine came out with the same parched-desert-looking crinkles across the top, the same melt-in-your-mouth chocolate discs throughout, the same moist-sandy texture I loved. Most importantly, you could really sink your teeth into each intensely cocoa-y bite the same way you could with hers. Yes, they sink in. Like I said, not your typical shortbread. Better, IMHO. Thank the Lord for Costco pounds of butter and Costco tubs of cocoa powder. This is my new addiction. Make it yours. Working with a stand mixer fitted with a paddle attachment, beat the butter on medium speed until soft and creamy. Add both sugars, the salt and vanilla extract and beat for 2 minutes more. Turn off the mixer. Pour in the dry ingredients, draping a kitchen towel over the stand mixer to protect yourself from flying flour and pulse the mixer at low speed about 5 times, a second or two each time. Take a peek- if there is still a lot of flour on the surface of the dough, pulse a couple of times more; if not, remove the towel. Continuing at low speed, mix for about 30 seconds more, just until the flour disappears into the dough- for the best texture, work the dough as little as possible once the flour is added, and don’t be concerned if the dough looks a little crumbly. Toss in the chocolate pieces and mix only to incorporate. Turn the dough out onto a work surface, gather it together and divide it in half. Working with one half at a time, shape the dough into logs that are 1 1/2 inches in diameter. Wrap the logs in plastic wrap and refrigerate them for at least 3 hours. (The dough can be refrigerated for up to 3 days or frozen for up to 2 months. If you’ve frozen the dough, you needn’t defrost it before baking- just slice the logs into cookies and bake the cookies 1 minute longer). Center a rack in the oven and preheat the oven to 325 degrees F. Line two baking sheets with parchment paper. Using a sharp thin knife, slice the logs into rounds that are 1/2 inch thick. (The rounds are likely to crack as you’re cutting them- don’t be concerned, just squeeze the bits back onto each cookie.). Arrange the rounds on the baking sheets, leaving about 1 inch between them. Bake the cookies one sheet at a time for 12 minutes- they won’t look done, nor will they be firm, but that’s just the way they should be. Transfer the baking sheet to a cooling rack and let the cookies rest until they are only just warm, at which point you can serve them or let them reach room temperature. 4. Turn the dough out onto a work surface, gather it together and divide it in half. Shape each half into a rectangle, 4.5″l x 3″w x 3/4″h. Wrap each half in plastic wrap and refrigerate for at least 3 hours. Center a rack in the oven and preheat the oven to 325 degrees F. Line one baking sheet with parchment paper. Lay both slabs onto the parchment paper, at least 3″ apart. Bake for 27-39 minutes*, or until there are cracks running across the middle of the cookie (see photo above). Take out and let cool completely. 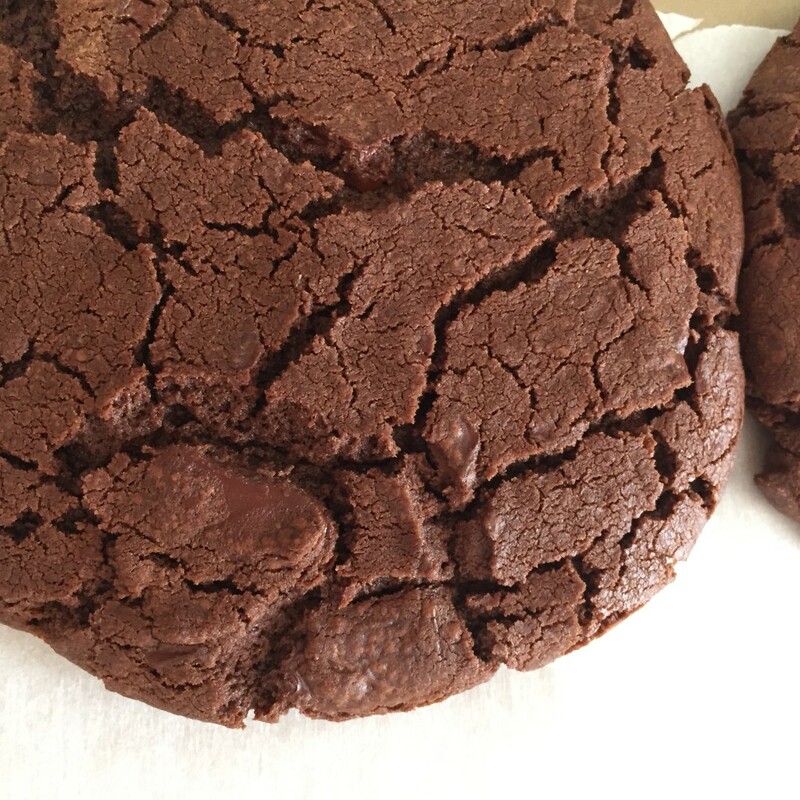 Then take a ginormous, satisfyingly cocoa-y bite out and enjoy cocoa bliss! The dough, with bits of butter and flour peeking through. *I know, HUGE window of time. But one time, it took me 27 minutes. Another time, it took 39. *SHRUG* Sorry. Guess you just have to watch it and find your oven’s own optimal time! Sift the 3 3/4 cups all-purpose flour, 1 cup unsweetened cocoa powder, and 1 1/2 teaspoons baking soda together. Working with a stand mixer fitted with a paddle attachment, beat 2 cups (4 sticks) + 1 tbsp unsalted butter (at room temperature) on medium speed until soft and creamy. Add 2 cups (packed) light brown sugar, 3/4 cup granulated sugar, 3/4 teaspoon fine sea salt (or 1 1/2 teaspoon fleur de sel), and 1 tablespoon vanilla extract and beat for 2 minutes more. Turn off the mixer. Pour in the dry ingredients, draping a kitchen towel over the stand mixer to protect yourself from flying flour and pulse the mixer at low speed about 5 times, a second or two each time. Take a peek- if there is still a lot of flour on the surface of the dough, pulse a couple of times more; if not, remove the towel. Continuing at low speed, mix for about 30 seconds more, just until the flour disappears into the dough- for the best texture, work the dough as little as possible once the flour is added, and don’t be concerned if the dough looks a little crumbly. 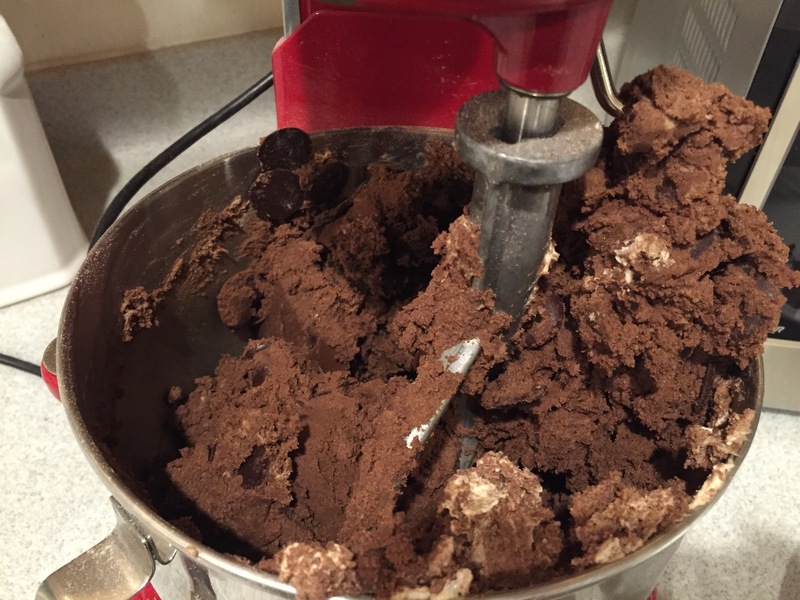 Toss in 15 ounces of chopped bittersweet chocolate and mix only to incorporate. To shape and bake, continue following directions above. Thank you so much for posting this recipe. I use to live in downtown SD and extra ordinary desserts was my go to place. I loved the short bread so much…I moved from there a few years ago and missed it ever since. I have searched so long for a recipe for that chocolate shortbread. I tried many recipes they were all good but none of them tasted like that one..I have my ingredients all ready to go ..i will post an update once I make them today. 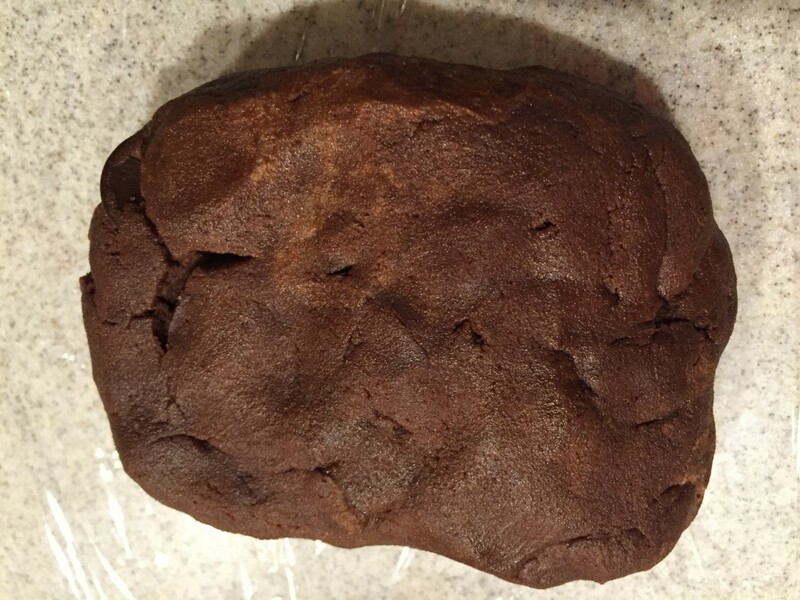 Great recipe..pretty darn close to the actual cookie. I will add a little less sugar next time.